Nutritionional therapists write several reports for clients on a daily basis. Reports range from meal plans, reading lists, diagnosis, or medical advice. At NutriAdmin, we interviewed dozens of nutritionists asking about this aspect of their profession and how software could help. Almost all respondents admitted spending between 1 to even 3 hours a day just writing documents for clients. Finding a more efficient way of writing reports would save considerable time for dietitians so that they can focus more on direct meetings with clients and other important activities. By having many conversations with nutritionists, we realised that the main inefficiency with reports is manually writing the same blocks of content over and over. Every client is different, and his or her case needs to be analysed on a one-to-one basis. However, many clients share common attributes that are always addressed in reports in the same manner. The content (paragraphs, tables, links, images) that nutritionists will write to refer to a certain condition will be almost always the same for everyone with that condition. For example, some clients cannot eat fish, but they need extra omega 3; they can all get the same or similar paragraph in their reports describing alternative sources of the nutrient like flaxseed or walnuts. As a nutritionist, you may have identified 12 common issues concerning your patient (e.g. he or she is lactose intolerant, overweight, eats too many carbs, is allergic to nuts, etc). Would it not be great to be able to have a big list of all conditions you deal with, and just select the ones that apply to each patient to get a first draft of your report done instantly? This is precisely what NutriAdmin does. NutriAdmin is a software for nutritionists and dietitians solution. Our aim is to help you spend less time with paperwork so that you can focus on other tasks, such as acquiring more clients. The reports feature is designed specifically to help you cut down the time you spend in writing, by making the process more efficient. With NutriAdmin reports, you only write each paragraph once. Your content is saved (including styling, images, tables, etc) and can then be re-used for other reports. Every time you write a report, you can select from a list of paragraphs and content parts written previously by you. At the same time, you have a summary of important data from your client always visible (e.g. pregnancy, allergies, foods avoided due to religion, etc) so that you can provide the most relevant recommendations to your patient in an efficient way. You can even use intelligent templates, that will populate the name, age, gender, allergies, and hundreds of other data fields automatically for each client based on their profile in the system. 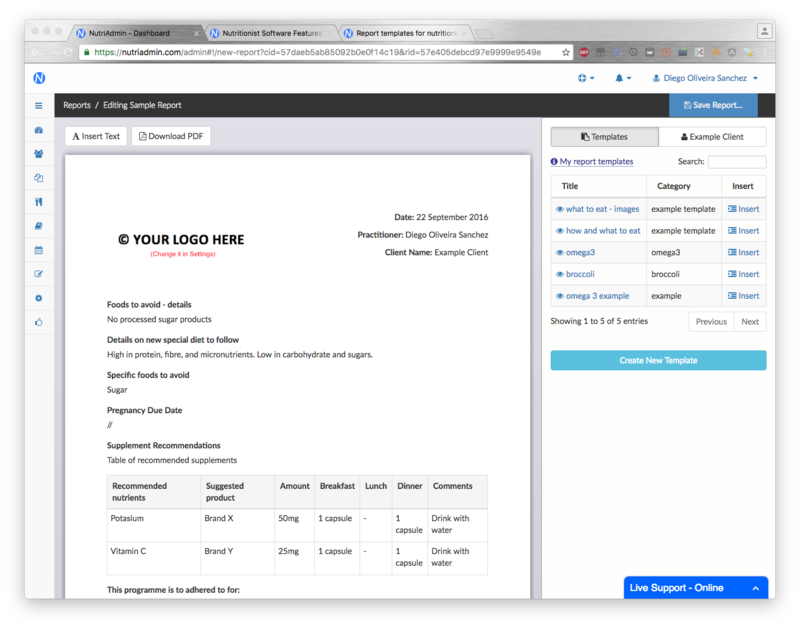 Watch a video showing how NutriAdmin's reports and templates work.